Davos has been stimulating not only for scientists, but also for other meetings such as the World Economic Forum, held every year in this unique city and winter sport enthusiasts. 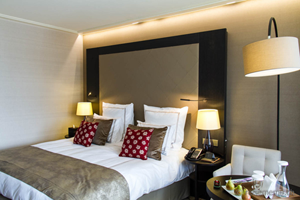 Davos provides 6‘231 guest beds in 58 hotels of all price categories. The Congress Centre can be reached by bus or on foot in maximum 20 minutes from every hotel. With the hotel check-in the guest will receive a guest card allowing the complimentary use of the public transport, which efficiently connects all hotels with the Congress Centre along with the skiing lifts. Please make your hotel reservation together with your meeting registration. You will find prices and more details about the hotels on the online registration form. We strongly recommend effectuating cancellation insurance. By request cancellation insurance might be effectuated through the Destination Davos Klosters by the insurance company “Europäische Reiseversicherungs AG”. EURO prices for your accommodation are solely a guideline for the purpose of price transparency, calculated in September 2018 (exchange rate 1 EUR = CHF 1.13, 1 CHF = 0.89 EUR). We reserve the right to change the prices due to changes of the exchange rate. The valid price for your hotel reservation will be confirmed with our official confirmation which follows by separate mail. If payment is accepted in Euro, the current exchange rate on the date of the invoice will apply by the hotel.